Wow, back to Windows 98; that was pretty extreme Have you contacted the manufacturer for recommended USB-to-serial converters? Well it was one of the laptops in the pile of still working but, outdated, and obsolete computers I have purchased over the years. I'm just glad it I can still use it for something. Why buy a Mac when you can just follow the Mac criteria? With a Mac you can ONLY buy certified compatible products. With a PC, especially now that NT is the only MS OS shipping on PCs, you can simply buy LOGO CERTIFIED products. Doesn't cost that much extra, and they usually do work. I'd bet that usb adapter that doesn't work in Vista (Windows NT v.6.1), isn't Vista logo certified. Pete, Nick obviously has superior software. My gen-you-whine Adobe Acrobat says your file upload is mysteriously defective and cannot be repaired, so it refuses to open. If I had to guess, it would be that you have three bypass diodes and one blocking diode. The bypass diodes allow power from the unshaded parts of a string or array, the blocking diode prevents power form flowing backwards into the whole panel in the dark. Some panels have neither, others vary. There have apparently also been some issues with panel failures at the bypass diodes--so some makers say they don't use them, or use fewer of them, in order to avoid the failures. My panels are divided into 3 strings of 18 cells each for a total of 54 cells. They are nominal 18 Volt panels. The schematic shows 4 bypass diodes, 3 of which bypass each string of 18 cells (ie, 1/3 of total). The 4th diode redundantly bypasses two of the strings. This arrangement means that in a series configuration, there would never be more than a two diode Voltage drop across the panel. Question: if one string of 18 cells drops out due to shading that still leaves 36 unshaded cells. Does this mean that in a shaded situation with one string shaded I can still produce an output from my remaining 36 cells. If true, this might give me an advantage in a parallel configuration over a parallel configuration of nominal 12 Volt panels. When this shaded panel is parallel'd to the other unshaded panel, I'm not sure what the Voltage seen by the controller would be. Since the unshaded panel would be putting out something close to 26 Volts does this mean the output from shaded panel is cut off? Pete, what is the nominal voltage of your panels? The "redundant" diode still sounds like a blocking diode, rather than a bypass diode. The placement and circuit function are what make the difference in the name, the diode itself may be identical. As mentioned, they are nominal 18 Volt panels with 54 cells. For comparison a nominal 12 Volt panel has 36 cells and a nominal 24 Volt panel has 72 cells. The open circuit voltage of my panel is 33. Blame the French for the pdf file since it came direct from Photowatt, a French company. You might try installing the free Foxit Reader which reads it without complaint. Pete, your panels are 54 cells all in series. Each cell produces approx 0.5v at Vmp and 0.7 at Voc. The specs on the panels show 26.8 Vmp and 32.8 Voc, so the numbers make sense. The diodes in the diagram show 3 series connected substrings of 18 cells each. With the ability to bypass each of the substrings independently, or the first 2 together using that 4th diode. Each substring will put out 1/3 of the voltage, 8.9v at Vmp. I'm giving the strings numbers 1 to 3 with 1 being the leftmost string. 2 diodes will be active as the 4th diode that parallels the diodes on string 1 and 2 only works when those two strings are both shaded. When you connect 2 panels in parallel and due to shading, the panels put out different voltages, the lower voltage panel is driven at the higher voltage. The power it will put out at that higher voltage can be read off the power curve in the specifications. Lets have 2 panels connected in parallel, one in full sun, the other with 2 or more cells of 1 string shaded. The unshaded panel should be at 26.8v for optimal power. The partially shaded panel should optimally be allowed to produce 17.2v per my scenario above. Since they are paralleled together, they must be at the same voltage, which will fall somewhere in between the two optimal voltages, an mppt controller will find this best voltage. Lets assume a dumb controller for example, that selects 26.8v. Each cell in the unshaded panel is producing 0.5v. However, in the shaded panel, the unbypassed strings are driven at 26.2 (0.6v consumed by the diode). Since there are now only 2 substrings totaling 36 cells, each must produce 0.72v, which would be the equivalent of the entire panel operating at 0.72 x 54 = 39v. 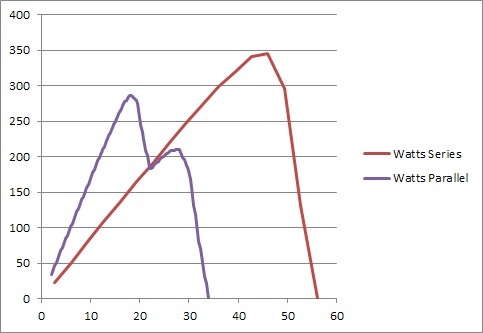 We can see on the power graph that at 39v, the panel produces 0 amps, so 0 watts from the shaded panel. The entire system will produce 210 w from the unshaded panel. Given a smart mppt, it may find a slightly higher voltage than 17.2 is optimal, but it will not be much higher as you can see the output of the second panel will drop off quickly as it is driven above Vmp. "As mentioned, they are nominal 18 Volt panels ...The open circuit voltage of my panel is 33." I smell smoke. As Jared says, that's a nominal ~24V panel, NOT a 12V panel at all. With all the cells in series. The MPPT point for typical cells is about 0.4V per cell, making your panel output about 22V at maximum power point. Not a 12V panel at all, so one hopes you are feeding it into an MPPT controller if there's a 12v system behind it. Anyway, back to solar panels. If two panels are in parallel, one fully shaded the other producing 30+ volts...that's like connecting a dead battery and a live one in parallel. The fully operational solar panel will be "backvolting" the shaded one, putting in high enough reverse voltage that conceivably could damage the diodes or the cells themselves. I wonder how much of that actual configuration has been part of the problem that has been reported, of panel failures due to overheated diodes burning out? Wow! I agree, converted due to job, Only use windows when I have to! Thought I'd play around with this a little more, produced a model in excel to draw up the theoretical power curves. This graph shows total power production in my above example of one substring on one panel shaded for both series and parallel. X axis is the array voltage. Here is my model showing the various amps, volts and watts produced in each example, measured at the cell, panel and system level. Note that a concern with the parallel setup is a flawed MPPT controller may set the voltage too high, at the smaller power peak producing only 210w (ie, only the unshaded panel puts out power). If it chooses correctly, looks like the optimal array voltage would be around 18v producing 286w. A few other points this raises. This example is with Pete's 18v nominal panels. On 12v nominal panels, this example would produce an optimal output around 12v, which wouldn't be high enough to charge your batteries if the controller can't boost it! This is the near* optimal case for parallel panels shaded. If a second string were shaded, the output of the second panel will drop to zero. Play with the attached spreadsheet to see (adjust the cell voltage of panel 2 so 18 cells are unbypassed instead of 36 in column N). *the actual optimal case is if both panels were shaded the same, it would be equal to series because it is just like have 2 smaller unshaded panels connected in parallel. Sorry, I've probably gone into too much detail I just love a good mathematical model. At a high level, my summary I wrote in July is correct. Nick, the PDF file was created with "Acrobat version 0.0" in the file attributes. I've used plenty of Macs, *nix boxes as well. They're no better than Wintel PCs, just different. When Mac was 3x the cost of a PC and only had 1/3 the number of mice buttons, it didn't earn any converts. If it makes you happy, great. It's a computer designed for folks who don't want to know how to shift gears or change spare tires, which is why Apple and the AAA have both been very popular among certain demographics. If Apple made solar panels, they'd be sealed, with proprietary output plugs and requiring the use of Apple-only controllers and Apple-only battery banks, and you wouldn't be allowed to discuss configuration or diode arrays, under threat of lawsuit for "jailbreaking" your panels. But we're talking about technical issues here, so no doubt all the Apple enthusiasts have been scared away, except for you. Anyway, all this data is great for the believers who are creating series arrays so it's very useful anyway . An aspect that isn't touched yet is about the best orientation of the panels in relation to the configuration of strings of cells in the panels. Like how does the shade from the boom tend to fall on a panel on a bimini and how can reduced output because of that be minimized.